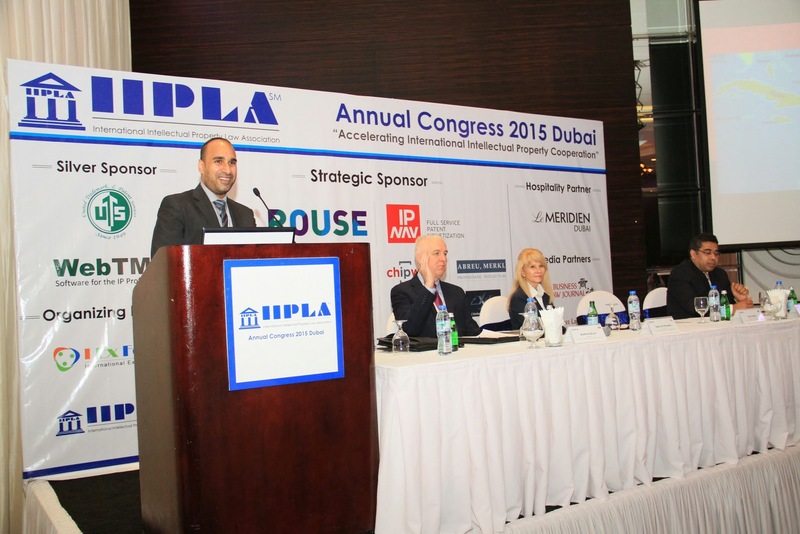 On 6th January, 2015, I had the opportunity to present at the International Intellectual Property Law Association‘s annual congress in Dubai, United Arab Emirates. 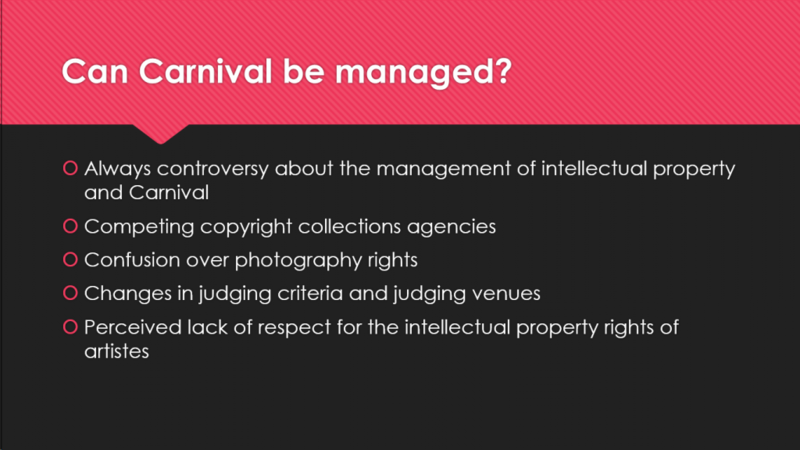 I chose to speak on the topic of Copyright and Caribbean Carnival, as many attendees may not have known about the work put into Trinidad and Tobago legislation on protecting works of mas. 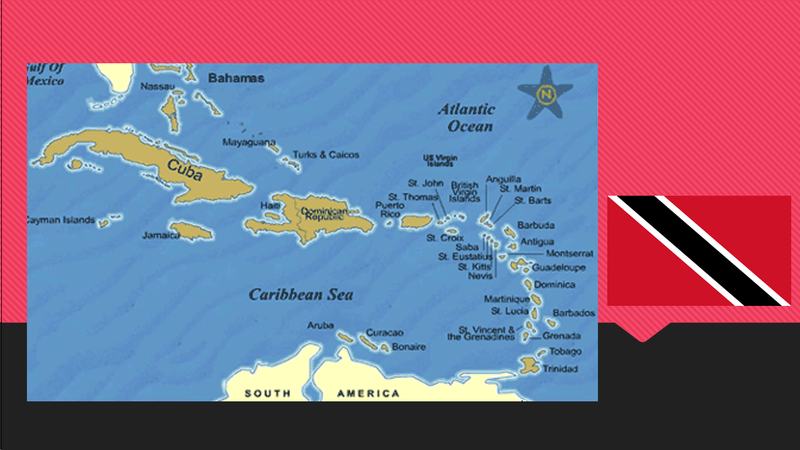 The Caribbean region is known for its rich and diverse culture. The traditional pre-lenten festival of Carnival has gained popularity across the world, yet intellectual property concerns often take a back seat while tremendous creativity and innovation is involved. 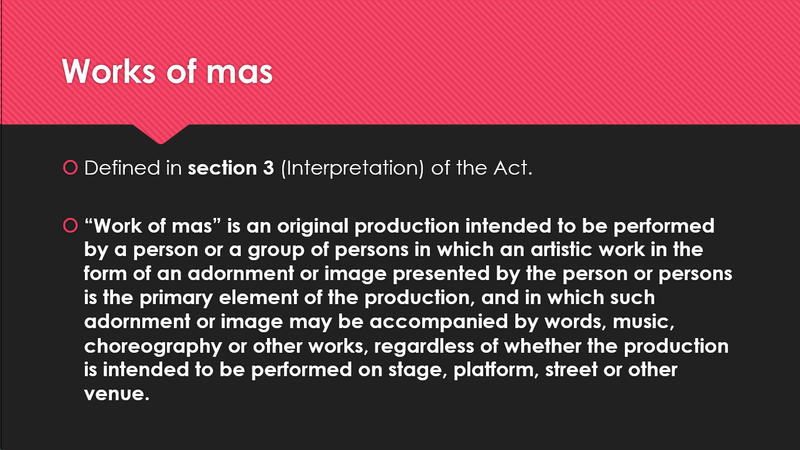 The Trinidad and Tobago Copyright Act makes some provisions for the protections of ‘works of mas’ to protect the rights of stakeholders in the Carnival industry. 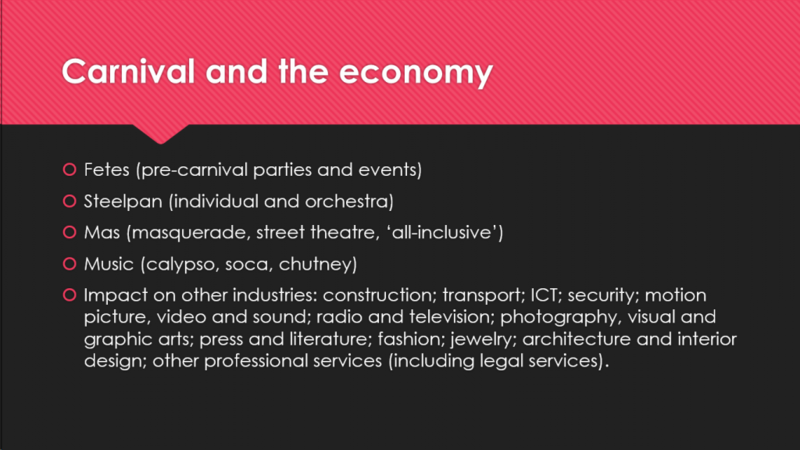 This presentation will examine issues such as photography and Carnival, media accreditation, licencing rights and considerations for designers and producers of artistic works. 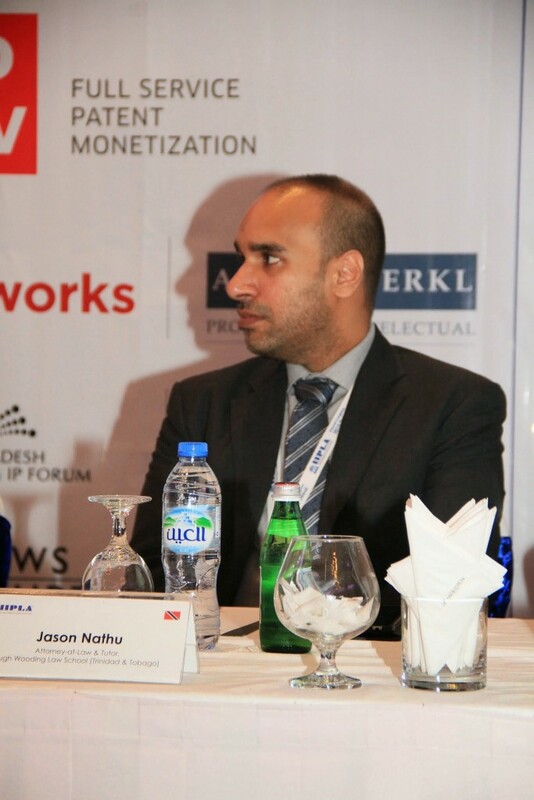 My presentation was delivered as part of a session entitled “IP scenarios in developed and developing economies“, at 8.00am in the WASL ballroom of the Le Méridien Dubai Hotel & Conference Centre. The other two panelists were Sherry Knowles, Partner, Knowles Intellectual Property Strategies (United States of America), who spoke on the topic “Creating the Optimal Legal Framework to Motivate Innovation in Developing Countries” and Kirit Javali, Partner, Jafa & Javali (India), whose topic was “Emerging IPR Developments and Challenges in India“. 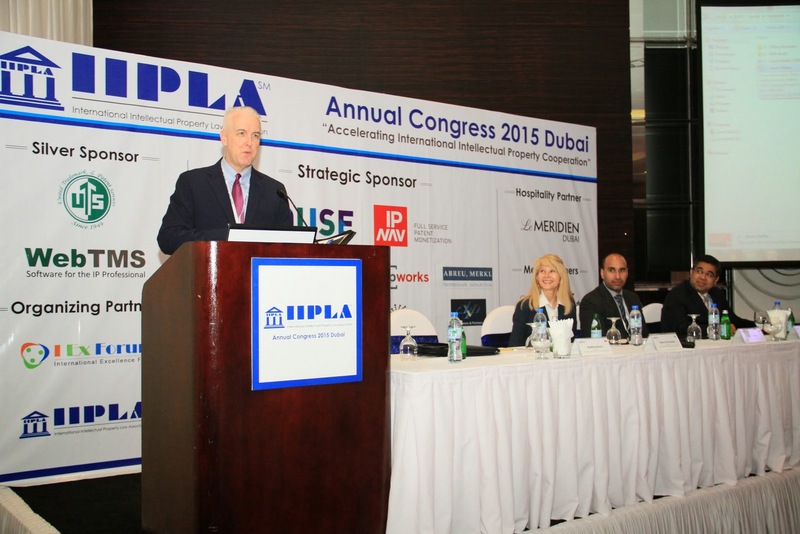 The session was moderated by Matthew Bryan, Director, Patent Cooperation Treaty (PCT), Legal Division, World Intellectual Property Organization.(Switzerland). I was the final of the three speakers, and after the heavy discussion on patent law in developing economies, I’m of the opinion that the topic of carnival was a welcome change. Many practitioners that I’ve spoken to, over the past day and generally over the years, tend to be attracted to intellectual property law, because it’s different. 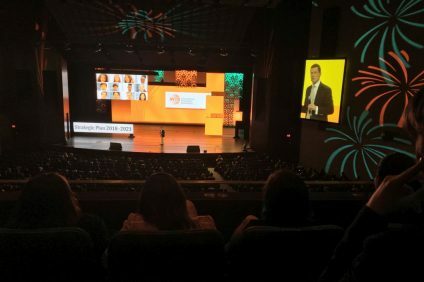 We are lucky enough to work among very talented, creative and innovative people, and it is this ingenuity that gives us a buzz, and makes us passionate about this area of law. 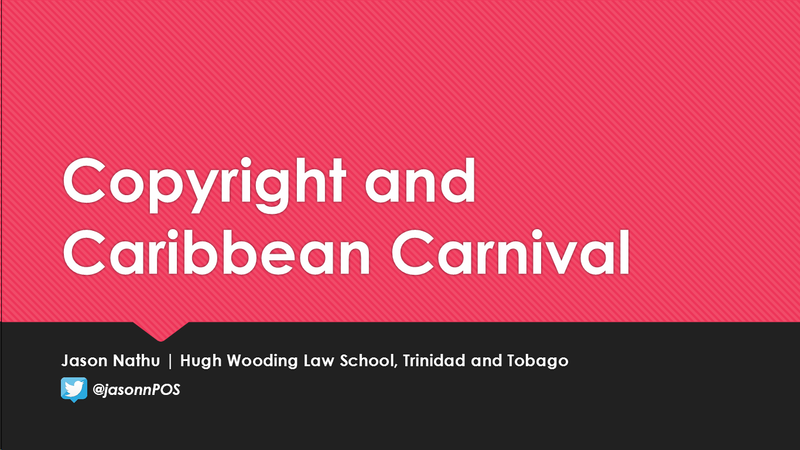 Today, my topic is Copyright and Caribbean Carnival. It is difficult to cover very much in 15-20 minutes, but I shall certainly try to inject some life and colour into the discussions. We’re already enjoying this lovely Dubai weather: now I want you to imagine yourself on the other side of the world, in the sunny Caribbean. 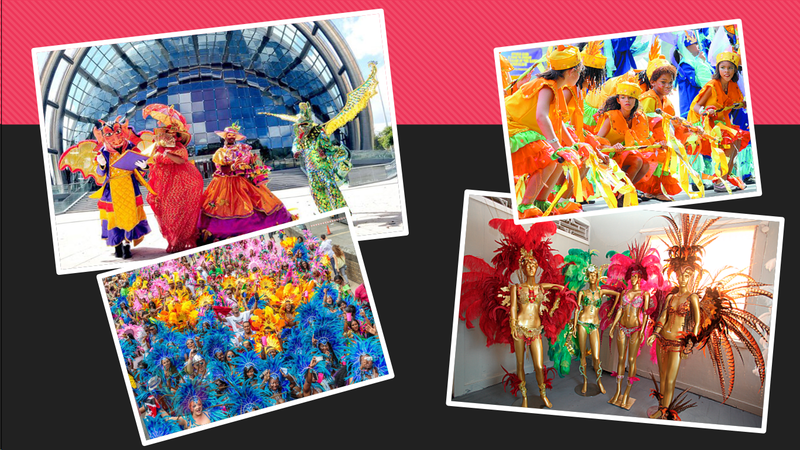 I will therefore be speaking mainly in the context of Trinidad and Tobago Carnival. 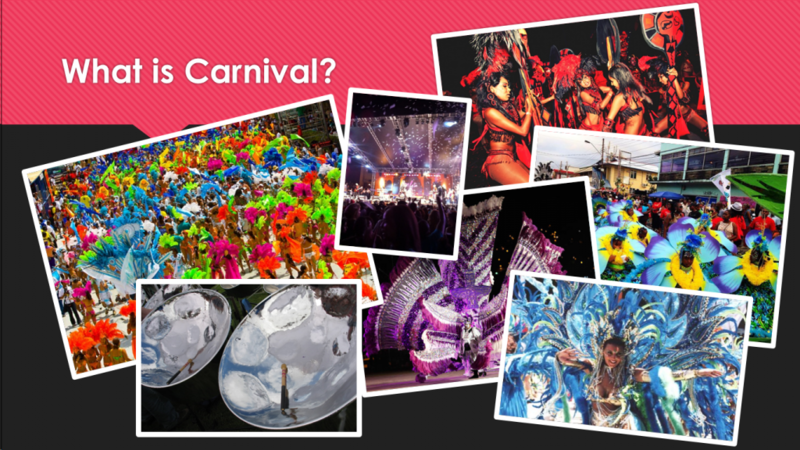 By a show of hands, how many of you have heard of Carnival? Carnival is not just one festival, but a series sandwiched in between Christmas and Ash Wednesday. And because Ash Wednesday is fixed 40 days before Easter, the season may be long or short (generally six to ten weeks) in which to pack the premier steelband, calypso and mas competitions in the world. Trinidad & Tobago created these unique art forms out of the confluence of cultures – European, African, Indian and Asian – assembled there in the centuries since Columbus. The songs of the slaves and their oral news network, have evolved to calypsos of social commentary and fast-paced rhythmic soca, the music and poetry of the Carnival. The masked balls of the European masters have exploded onto the streets, with costume and mime, with characters such as devils, demons, midnight robbers, bats and moko jumbies, and dancing parties, thousands strong, reveling in liberatingly loud music and licence to cavort in the heart of Port of Spain’s business district! It is this transformation wrought by costume and music that has been called simply ‘mas’, a term which is used to refer to children, adults, individually or in bands, costumed for street or stage parades. Trinidad and Tobago is different from the other Caribbean islands, in that our economy is not based on tourism, but rather on oil and gas. While we do have beautiful beaches, coral reefs and numerous eco-tourism attractions, it is our diverse culture which is the hub of our tourism sector. 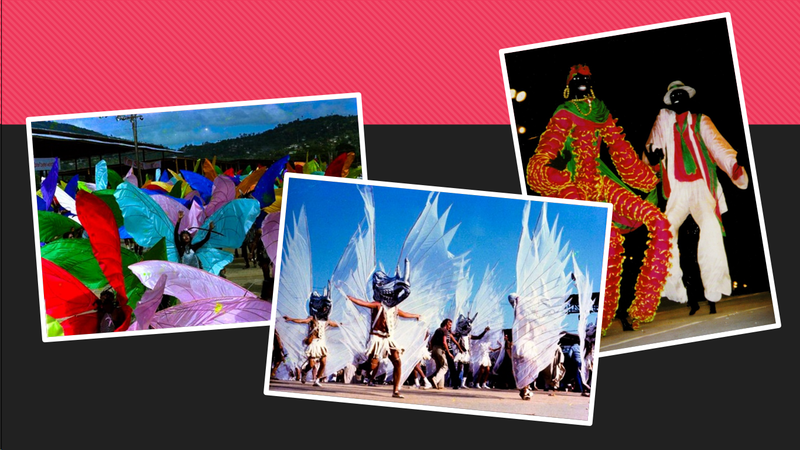 Carnival is but one of our festivals, and it fuels its four major industries, namely: fetes, steel pan,mas and music. The convergence of these four core Carnival industries also has an impact on several other industries including construction; transport; ICT; security; motion picture, video and sound; radio and television; photography, visual and graphic arts; press and literature; fashion; jewelry; architecture and interior design; other professional services (including legal services). 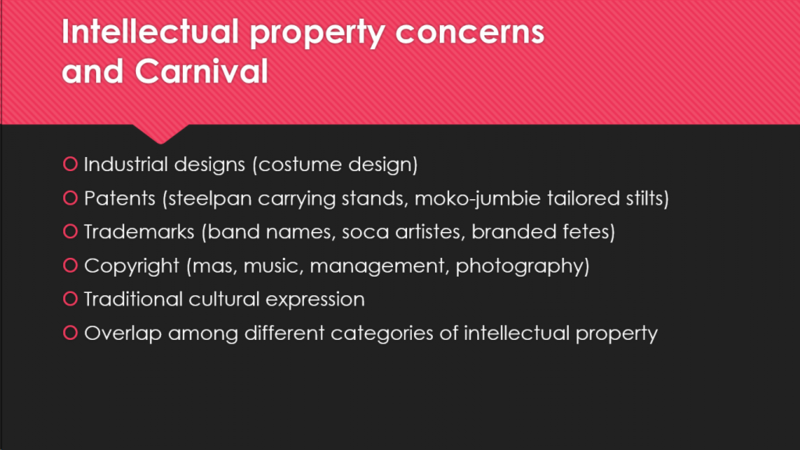 Although this presentation is focused primarily on copyright, there are various intellectual property concerns which impact on the Carnival industry. 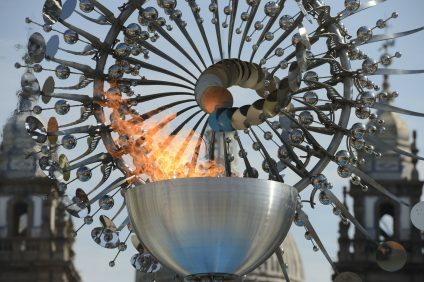 Carnival touches on industrial design protection, patents, trademarks, of course copyright, and traditional knowledge and cultural expression. There is also some overlap among these areas, as it relates to intellectual property protection in the Carnival industry. 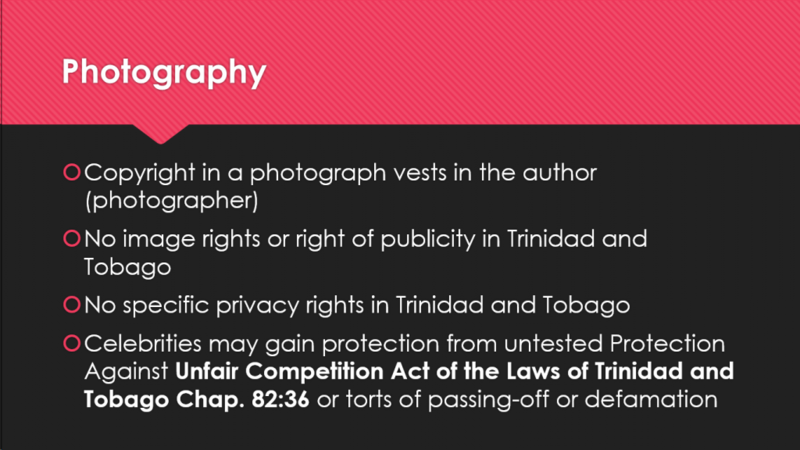 What is protected by copyright in Trinidad and Tobago, comes directly from the international conventions, and UK legislation, as we are a Commonwealth jurisdiction. 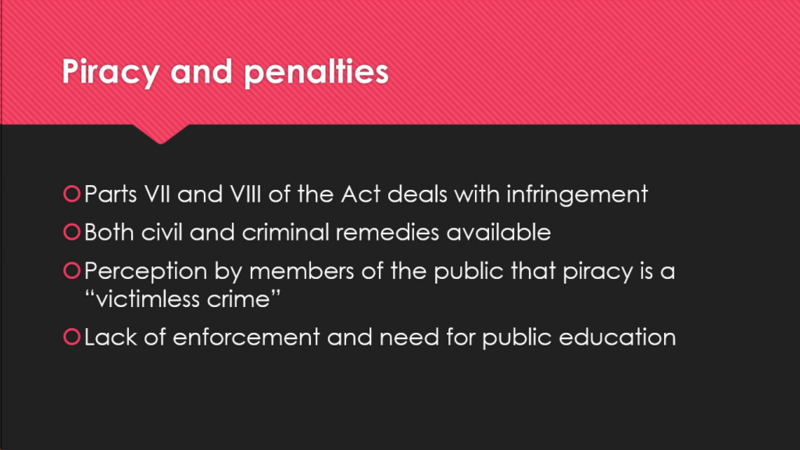 How the Trinidad and Tobago Copyright Act differs from any other copyright legislation anywhere else in the world however, is that we have built-in to our legislation protection for what we term “works of mas”. 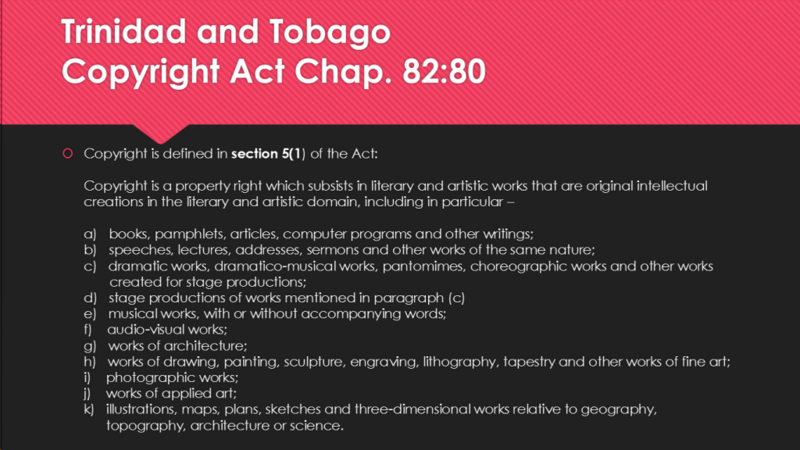 As we see in section 6 of the Act, a “work of mas” is treated as a “work”, and is therefore offered protection under Trinidad and Tobago legislation. In speaking about copyright and Carnival, I’ve divided this presentation into four (4) parts, namely mas, music, management and what I call mayhem. 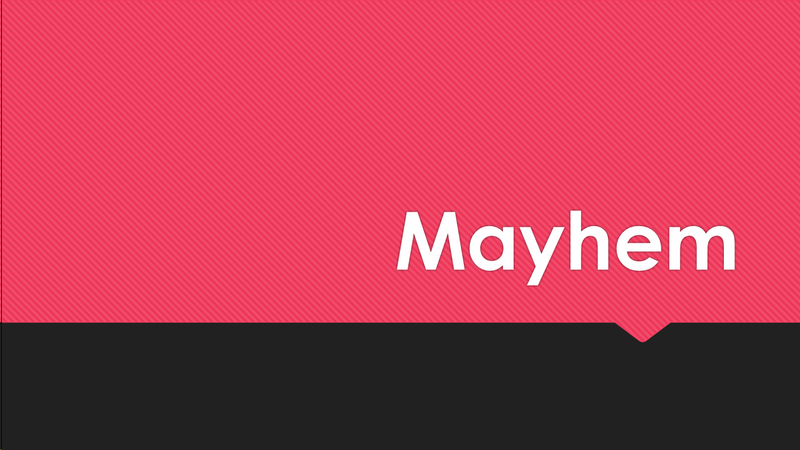 I used the word ‘mayhem’ because I wanted to be poetic and use a word beginning with the letter “M”, but I’ll explain later why this word is apt in the circumstances. Before we go to the definition of the term ‘works of mas’ as stated in the legislation, I want to show you a short video, which was produced by the Trinidad and Tobago Intellectual Property Office, and which was generously given to me to use as a part of this presentation by the Acting Comptroller. 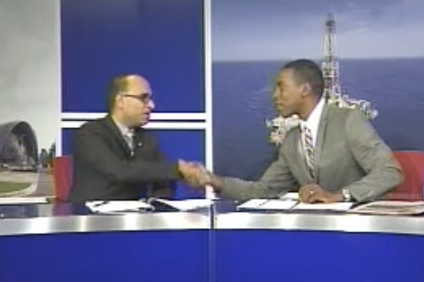 I was able to speak generally about the good work of the Trinidad and Tobago Intellectual Property Office (IPO), and showed a four-minute video produced by the IPO on works of mas. After the video, I continued my presentation. Moving now to the legal definition, we look at section 3 of the Act. Carnival as a street art form is fuelled by mas designers, the most notable of whom are Peter Minshall and the late Wayne Berkley. While the rationale for including ‘works of mas’ in the national legislation came from carnival stakeholders themselves, very often ‘works of mas’ are essentially a collective work with no single author and it goes against the very grain of what “authorship” is supposed to be. Mas has spread throughout the Trinidad and Tobago diaspora, so that people can find mini versions of our Carnival around the world. So then, would a copyright policy to protect mas travel from the Caribbean to Noting Hill to Labor Day (Brooklyn) to Caribana (Toronto)? And what about mas that is only inspired by Trinidadian culture but is arguably not “Trinidadian”? These are issues that would foster further academic research, as a practical solution for protecting work of mas is found. Let’s move quickly into the realm of music and Carnival. 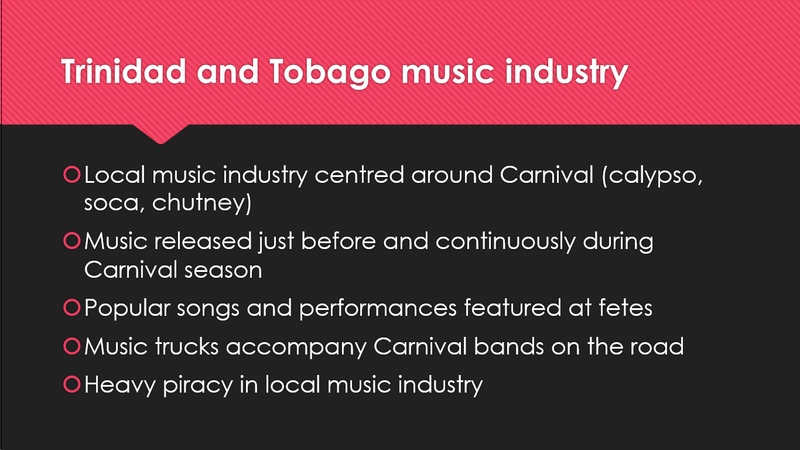 In Trinidad and Tobago the music industry thrives mainly around the Carnival season.Before the season even starts, many artist have already composed, produced and published numerous songs; some of which are soca, chutney, calypso and kaiso just to name a few. 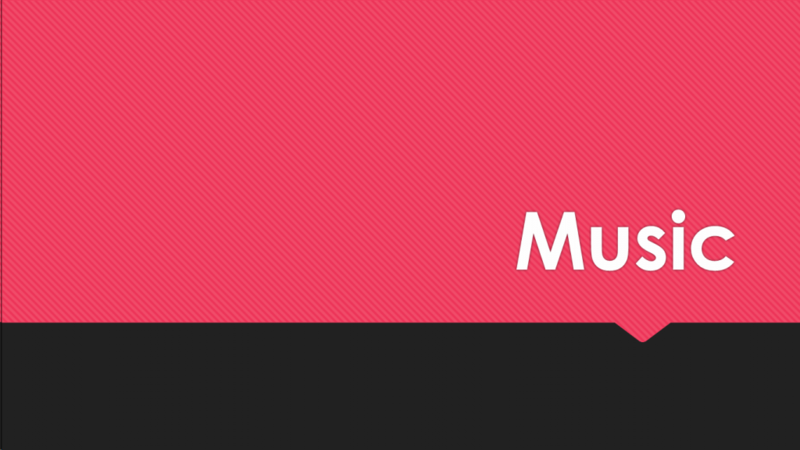 Yet, there is heavy piracy in the local music industry. I can go online now, and download all the fresh new songs for Carnival 2015, without paying a cent to any of the artistes. Local artistes invest valuable time, capital and other resources into their work and the profits in most instances end up in the pockets of pirates instead of where should rightful be. It is the same local artiste who loses this revenue that will inject and invest back into the economy in one way or another. People therefore need to see and understand that they are not only taking from the artiste but also from the economy. This can only happen through public education. 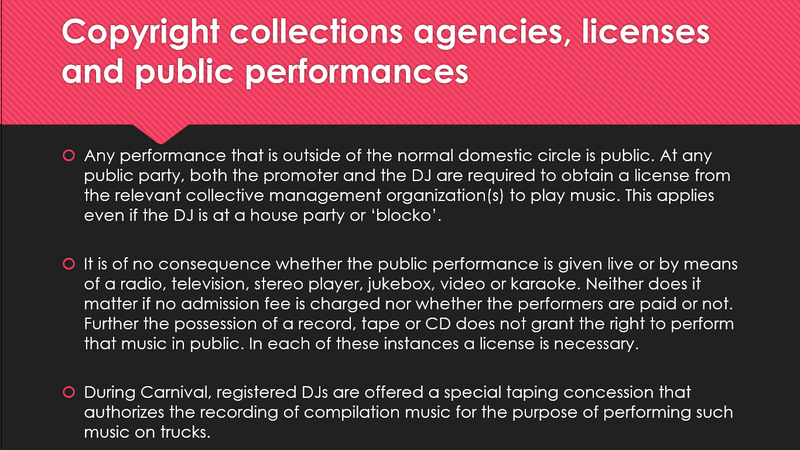 A license from a copyright collection agency is required to play music at any carnival party or ‘fete’. 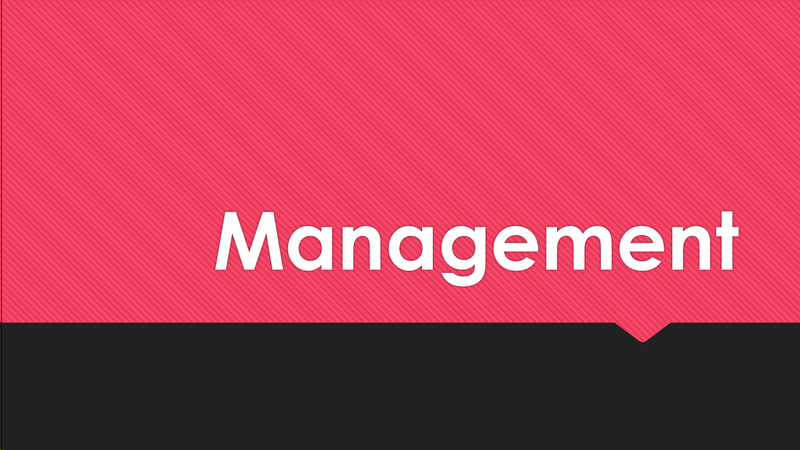 There are several such competing agencies, and there is always controversy as to which agencies are duly authorized to collect royalties. A license is not required for: the playing of music in the privacy of your home; performances during religious services in churches or other established places of worship; or live performances of musicals, operas, ballets and other dance. There are various competitions associated with Carnival (steelband, calypso, soca, traditional characters, parade of the bands). The organizing bodies (NCC and NCBA) attempt to restrict access to judging venues by offering licenses and accreditation to various media. 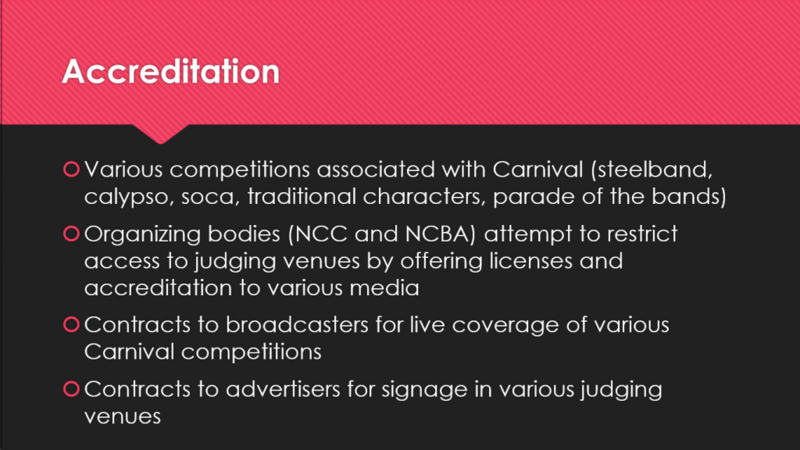 Contracts are given to broadcasters for live coverage of various Carnival competitions, and contracts are awarded to advertisers for signage in various Carnival judging venues. If a photographer takes a picture of someone in a carnival costume , the masquerader does not own the photograph, the photographer does. The masquerader may be able to negotiate to get an electronic version or print but that does not equate to ownership of the intellectual property unless there is an assignment of the copyright in writing from the photographer to the person, signed by the photographer. In Trinidad and Tobago, there are no specific laws that deal with image rights and the use of an individual’s image. One question which is commonly asked around carnival time is whether masqueraders can take photographs of themselves and others and what happens if other people take photographs of the masqueraders. Where an individual is in a public place, there is no legal requirement that the individual’s permission should be obtained prior to taking the photograph. If during carnival, a masquerader’s image appears in a carnival compilation through an accredited photographer, then there is not much the masquerader can do to object. 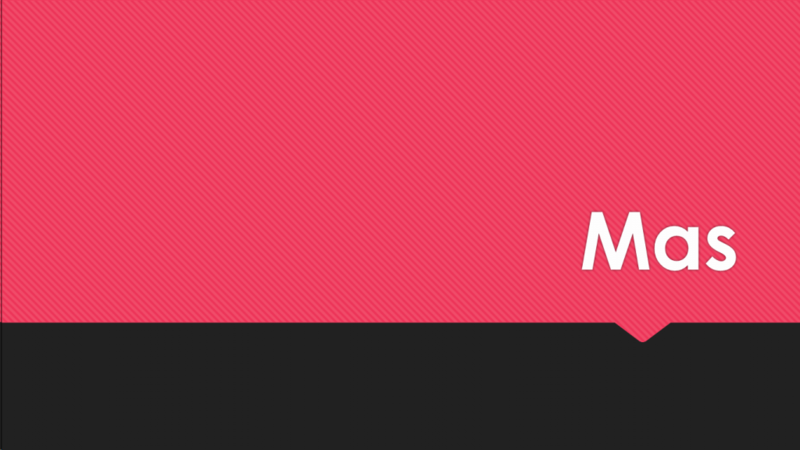 In relation to celebrities and well known individuals such as famous entertainers/ sports persons, the protection of their images in Trinidad and Tobago is dealt with through the application of various laws such as passing-off, defamation, malicious falsehood, registered trademarks and contract. There is a popular calypso that starts with the words “Carnival is bacchanal and bacchanal is Carnival…” Indeed, controversy and chaos are synonymous with Carnival, and some argue that they are in fact elements of the festival itself. 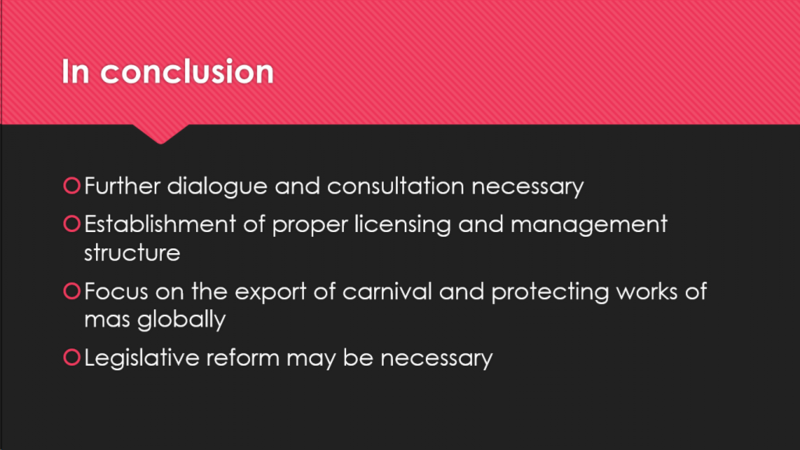 We have made great strides in terms of providing protection for works of mas, but we have a long way to go in terms of capitalizing on the Carnival economy, and managing it properly. I spoke briefly on controversy over the past few years in the management of carnival, and then concluded the presentation. The response to the presentation was phenomenal. Many delegates came-up to me afterwards expressing a desire to visit Trinidad and Tobago. Others asked for copies of our Copyright Act for further study. Previous Post What is an arrest?